Take the elaborate mechanics of Tekken, fuse it with the fast-paced action of Super Smash Brothers, and throw on a Pokemon overlay, and Pokken Tournament would likely be the result. I didn’t quite know what to expect upon picking up my Wii U gamepad and jumping into battle with Pokken’s colorful cast of Pokemon. I was pleasantly surprised to find a tournament fighting experience whose gameplay is both fundamentally solid and unexpectedly complex. The game finds some nice middle ground between the in-depth mechanics of seasoned fighting franchises like Tekken and Street Fighter, and the more simplistic, arcade-style zaniness of the Smash Brothers series. At the same time though, being a sort of jack of all trades, it doesn’t quite excel in either category - doing little to stand out and verging on tedious at times. What we’re left with is an enjoyable competitive multiplayer experience that both Pokemon fans and fighting aficionados are likely to appreciate to some degree, but probably won’t soon be replacing Tekken as the definitive fighting experience. I am typically not much for tutorial modes, but Pokken Tournament’s proves to be very useful. Particularly if you plan on delving into the later portions of the campaign mode or try your hand against some seasoned online veterans, you’ll be well served to find your bearings with the game’s fundamentals. Furiously mashing buttons mindlessly ala Smash Brothers might get you by in the early goings, but all it takes is a humbling shellacking with someone who really knows what they’re doing to realize that there are many complexities and nuances hidden under the hood of Pokken Tournament’s charming exterior. You will be helped along during the tutorial, as well as during the matches themselves, by the awfully chatty Nia, who apparently finds the need to hang around and bombard you with comments and “tips” during each match. Aside from a few moments where I was reminded to activate my “burst mode” for instance, her constant commentary tended to annoy more than assist me. Thankfully, it can be toned down in the options menu. Either way, Nia’s Pokken 101 lessons during the tutorial at least do prove helpful, as there is a long laundry list of attacks and mechanics to wrap your mind around. You have both a normal and power attack, in addition to a special move. But that is only the foundation of the game’s mechanics, as combining a direction on the joystick with each button activates an entirely different move, and you can also utilize combos by pressing buttons in various sequences. In addition, you are able to block, counter attack, or grab your opponent, which can drastically shift the momentum of the game. This is because these moves utilize a rock-paper-scissors set of rules, in which one move will always have the advantage against another, so being able to recognize these actions and react accordingly is a large part of Pokken’s strategy in gaining the upper-hand. Adding yet another layer to all this - you will frequently shift between the more long range “field phase”, and the up-close-and-personal “dual phase.” These act as essentially 3D and 2D battlefields, respectively, and further change the dynamics of the fight, altering each Pokemon’s moves and strength. Simply trying to spam more attacks won’t necessarily be enough to take out an opponent, as landing the right combination of moves at opportune times, as well as countering their actions in the proper manner, is often the key to outlasting them. Sometimes you might find yourself struggling to get into any sort of rhythm at all, even if you feel you’ve mastered the intricate workings of Pokken’s controls. This is amplified by the game’s sometimes overly-brief matches that come courtesy of some overpowered attacks. Indeed, once an opponent is on their heels from a player rolling with various combo and/or powerful attacks, it is often difficult to shift the momentum back in your favor, particularly considering how fast a Pokemon’s health can frequently dwindle down. The name of the game can sometimes boil down to simply building up your Pokemon’s “synergy gauge” more quickly than your opponent, then unleashing hell with an elaborately animated, super-charged attack that burns through much of your opponent’s health. As for the Pokemon themselves, there are sixteen to choose from off the bat, with a couple more to unlock later in the game. It may seem like a pretty small palette out of an arsenal of over a thousand Pokemon, though it is sufficient enough considering each of them come with their own characteristics and more-or-less have a distinct feel from one another. Some Pokemon, such as Pikachu for instance, are speedier, while Charizard will be far more slow and sluggish, but packs a bigger punch. Some will emphasize long-ranged attacks, while others are better suited for melee blows. You also have the “technical” types, like Gengar, a personal favorite of mine, who is designed to dish out a wide range of jarring moves to keep your opponent off balance. Additional Pokemon also make brief appearances via the game’s unique support gauge, which will allow you to summon a backup Pokemon to provide some assistance, coming in the form of either a buff, debuff, or special attack. From my experience, these Pokemon helpers generally failed to truly shift the momentum of a battle, but they can serve to be an amusing wild card to use during the heat of battle. The bulk of the gameplay is found in Ferrum League Mode, where you will spend a great deal of time moving up the ranks fighting randomly selected characters. This is where the game’s tedium can become quickly apparent. Although battles provide their share of fun and intensity, you will be required to play through several CPU opponents to even reach the threshold required to qualify for the actual tournament. Once you have clawed your way to the top and triumphed in the big show, you then square off against a gym leader, which will unlock the next league, filled with more difficult opponents. Rinse and repeat. Even as I was able to burn through the battles relatively quickly and easily, it still became a somewhat repetitive and lengthy process to even unlock the second league from the sheer amount of battles required to build your rank. Some more unlockables and customization could have made an otherwise lacking campaign a bit more enduring. There is, in all fairness, a surprisingly large and diverse quantity of avatar customizations. At the very least, they are fun to play around with and help to add little flavor to the campaign. They also happen to be the only things you are permitted to spend your in-game currency on. There’s not much depth to be found in the way of narrative either, outside of a vague storyline involving a mysterious trainer and her shadow Mewtwo. Though with a game like this, such a brief and simplistic narrative is perhaps to be expected. If you are looking to up the ante in terms of both excitement and challenge, you will likely want to put your skills to the test in online mode. This quickly proves to be another strong suit of Pokken Tournament, and one you’ll probably find yourself more inclined to return to. My experience with the game’s online mode, despite the frustrations of frequently being put in my place with players clearly more seasoned than myself, was one primarily of enjoyment. Matches were almost always created quickly, and even on those rare instances they weren’t, you are swiftly thrown into a battle against a CPU opponent. This is a subtle, but wise inclusion, as it serves as both an ample boredom killer and an exercise in honing your skills while you wait to match up with a player. The matches themselves ran smoothly, and even when battling fellow Pokemon trainers around the world, were surprisingly lag free. You can choose to play a casual match or a ranked battle, the latter of which comes with a simple, yet effective rank-up system. Squaring off against real players that know what they’re doing often proves to be an almost jarring leap in difficulty as compared to the first couple of Ferrum League tournaments, so much so that you may just find yourself humbled to the point of retreating back to Nia in the tutorial mode to further refine your skills. The online play acts as a fun and enduring alternative to the somewhat uninspired Ferrum League, bringing up the game’s replay value significantly. Being a fighting title, Pokken Tournament predictably also shines with its local multiplayer, at least in some respects. Going head to head with a friend near you skill level will almost inevitably make for some thrilling matches, and perhaps even some frustrated controller slamming. Speaking of which, the game also utilizes the gamepad screen in this mode, allowing one player to use the screen while another uses a traditional controller in addition to having the luxury of looking at the TV screen. This proves to be a neat addition, though unfortunately brings the frame rate down significantly. The option for a traditional split-screen mode (without having one player having to use the gamepad screen) is also strangely absent, though there is LAN play as well, so those with enough dedication can opt to go that route. The graphical prowess is another bright spot of Pokken Tournament. This is probably the best looking Pokemon to date, as it is filled with some vibrant and colorful aesthetics, detailed character models, and flashy effects - the latter of which really come to the forefront during the epic synergy burst attacks. This is topped off with a slew of stages that consist of some diverse and detailed backdrops, which manage to be visually appealing without being distracting. 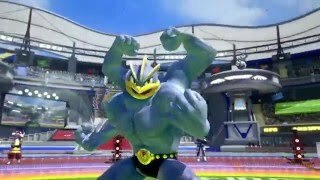 Fans of both Pokemon as well as the fighting genre as a whole should definitely give Pokken Tournament a shot. It is unlikely to deter you very long from your more traditional fighting game, and certainly won’t act as a replacement for a mainline Pokemon title. But with that said, it serves as a surprisingly well-crafted Pokemon fighter, that tones down the complexity of Tekken and Street Fighter, while still not skimping out on the details. Though the campaign is nothing groundbreaking, and there are areas that could have been strengthened here and there, those seeking an intense competitive multiplayer experience will likely find plenty of enjoyment here. Slick and detailed graphics along with a charmingly colorful anime-like aesthetic and a diverse palette of stages makes Pokken a visually pleasing experience. Constant commentary by your “advisor” Nia gets a bit annoying but can thankfully be toned down. A wide variety of moves to play around with, along with a plethora of nuances and solid mechanics make for an in-depth fighting experience which rarely fails to amuse. Battles sometimes go by a bit too fast to always appreciate this, however. The Ferrum League at least starts out enjoyable, but grows monotonous after several dozen battles of trying to fight your way up the ranks. There is little in the way of customization outside avatar flair and stat points which don’t seem to make a huge impact on your fighter. Online multiplayer in particular is where this game truly shines - running near flawlessly and offering a simple, but effective rank-up system to provide incentive. The exclusion of gamepad-less local multiplayer is unfortunate. Load times are somewhat lengthy at times, but otherwise very little hitch in performance. Online play was nearly lag free. The game runs smoothly, particularly in single player, though the drop to 30 FPS in local multiplayer is unfortunate. What you see is pretty much what you get here – Pokken Tournament is a solid multiplayer experience that should make both Pokemon and fighting genre aficionados take notice. "An adrenaline-pumping Pokemon Battle Royale"
Pokken Tournament is ranked #919 out of 1434 total reviewed games. It is ranked #77 out of 138 games reviewed in 2016.